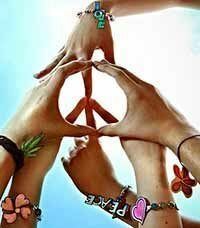 Peace, man!✌ Have you heard about hippies, their passion to the weed, and what's more important - their signs. Peace signs ☮ ✌ are popular computer symbols that people had been texting from the times when Unicode encoding was developed. The internationally recognized symbol for peace ☮ was originally designed for the British nuclear disarmament movement by Gerald Holtom in 1958. The symbol is a combination of the semaphore signals for the letters "N" and "D," standing for "nuclear disarmament". In semaphore the letter "N" is formed by a person holding two flags in an upside-down "V," and the letter "D" is formed by holding one flag pointed straight up and the other pointed straight down. Superimposing these two signs forms the shape of the centre of the peace symbol. The ✌ sign is a hand gesture, palm outwards, with the index and middle fingers open and all others closed. It had been used to represent victory during the Second World War. In protests in the USA against the Vietnam War in the 1960s and in subsequent anti-war protests it was adopted by the counterculture as a sign of peace. Choose your system to find out. Configure your keyboard layout in Windows so that you can type all additional symbols you want as easy as any other text. Takes about 5-10 minutes to set things up, but you'll be typing like a boss. You can assign peace symbols ☮ and any other text characters to your keyboard using this technique. CharMap allows you to view and use all characters and symbols available in all fonts (some examples of fonts are "Arial", "Times New Roman", "Webdings") installed on your computer. You can input peace symbols using it. Character Palette allows you to view and use all characters and symbols, including peace, available in all fonts (some examples of fonts are "Arial", "Times New Roman", "Webdings") installed on your computer. There actually are 3 different ways to type symbols on Linux with a keyboard. But only third and fourth level chooser keys and unicode hex codes can produce peace text symbols. Character map allows you to view and use all characters and symbols available in all fonts (some examples of fonts are "Arial", "Times New Roman", "Webdings") installed on your computer. It can also help you lookup Unicode codes for entering symbols with keyboard. Drag this heart to your bookmarks and quick-access the best symbols anytime. Click it to try here.